Maroon 5 & Intel Drones Light Up Super Bowl Sky » UAV DACH e.V. 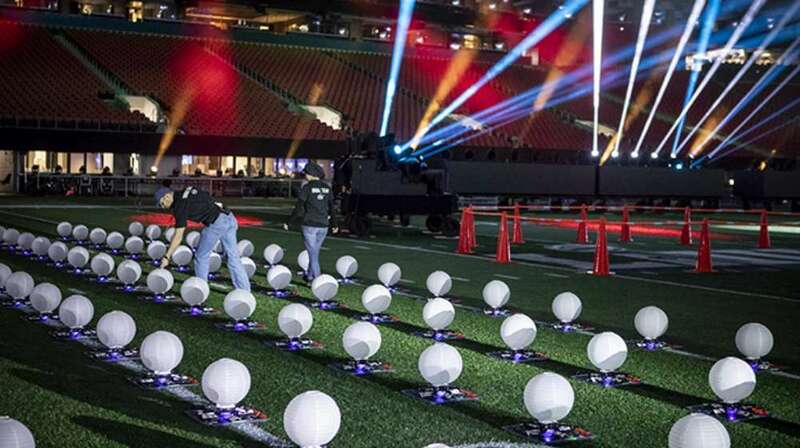 During the Super Bowl, Intel Corporation partnered with the NFL to create the first-ever live drone light show during a Super Bowl Halftime Show. Intel and the NFL will also make advanced Intel True View highlights available for fans to relive the most exciting moments of the biggest game of the year. As an Official Technology Provider for the NFL, Intel installed Intel True View in 13 NFL stadiums, including Super Bowl LIII host Mercedes-Benz Stadium. Volumetric capture is enabling immersive experiences that bring the game to life from every angle, allowing fans to analyze key plays with multi-angle views, including through the eyes of the players. Using high-performance computing, Intel True View transforms massive amounts of volumetric video data captured from 38 5K ultra-high-definition cameras into immersive 3D replays of the game’s biggest moments. UAV DACH: Beitrag im Original auf https://www.uasvision.com/2019/02/05/maroon-5-intel-drones-light-up-super-bowl-sky/, mit freundlicher Genehmigung von UAS Vision automatisch importiert. Der Beitrag gibt nicht unbedingt die Meinung oder Position des UAV DACH e.V. wieder. Das Original ist in englischer Sprache.